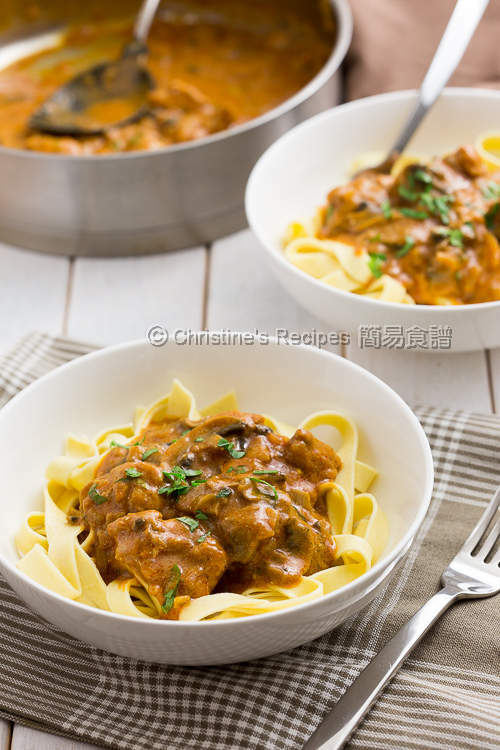 This chicken stroganoff dish has packed with big flavours, yet easy to make, and perfectly goes with any pasta, noodles or rice. 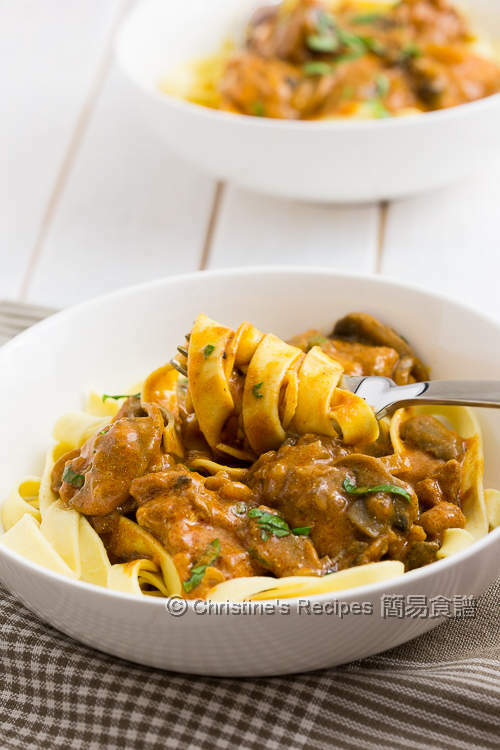 This recipe is inspired by the classic Russian dish, called beef stroganoff. Nearly all the ingredients are staples kept in my kitchen for making western cuisine. It’s a fuss-free dish to make even on a hectic day. What I need to do is to sear the chicken followed by braising with the sauce for a while. And it’s done. 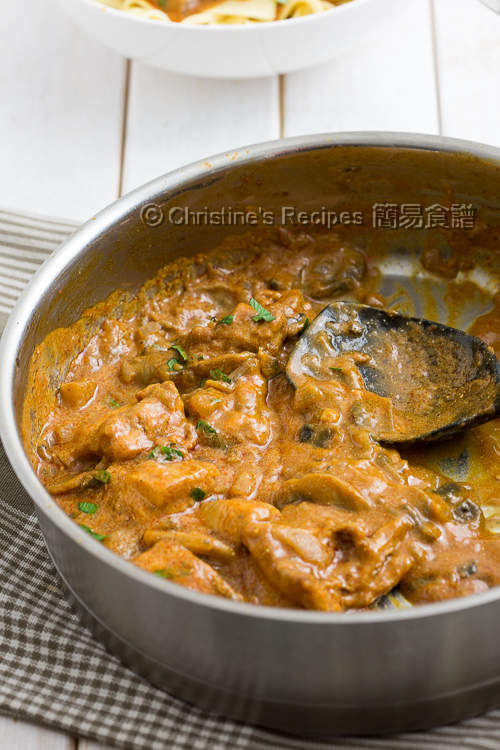 The creamy sauce makes the tender chicken meat full of flavour. I even didn’t want to waste any bits of the sauce, so I swirled the pasta around the bowl to pick up the last bit of it. No wonder it’s so popular around the world. Rinse the chicken and wipe dry with kitchen papers. Cut into 4cm / 1.5inch-sized pieces. Season with salt and pepper. Evenly coat with sweet paprika and flour. Heat half of the butter and half of the olive in a frying pan over high heat, in one single layer, and sear the chicken for 2 minutes, or until lightly browned. Set aside and cover to keep warm. Heat the rest of the butter and olive oil over medium-high heat. Saute the onion. Add the sliced mushrooms. Cook until mushrooms are dried up. Add a little more oil to saute shallot. Pour in white wine. Increase heat to high. Cook until reduced by half. Add in tomato paste and Worcestershire sauce. Stir to combine. Pour in the chicken stock. Bring it to boil. Add the chicken. 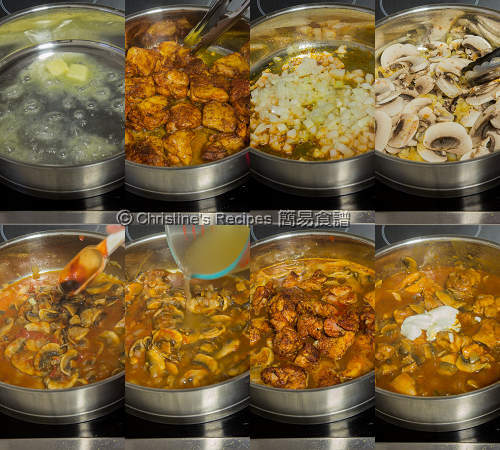 Reduce heat to medium and cook for about 20 minutes, or until the chicken is cooked through and sauce is thickened. Remove from heat. Stir in sour cream. Sprinkle parsley. While cooking the sauce, prepare a large pot of salted water. 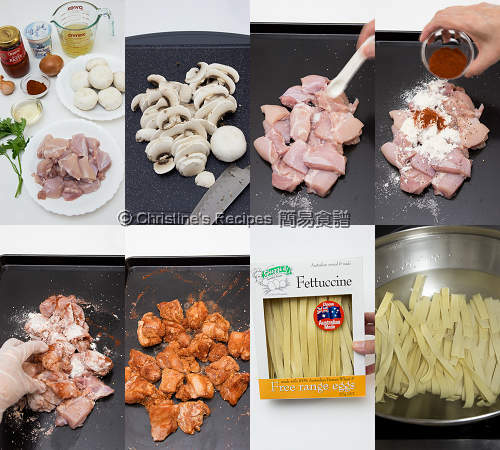 Cook the Fettuccine according to the instructions on packaging, until al dente. Mine needs 8 minutes of cooking. Drain up and place in individual bowls, ladle the sauce on top. Sprinkle more parsley for garnish. Serve hot. Try to get boneless chicken thighs. Chicken breast works too. Don’t skip the sour cream as it will bring up the whole dish up a notch. It’s available at supermarkets. I used the less fat one. Sweet paprika has a mild sweetness, not hot at all. You can get it from Asian grocers or supermarkets. Amazing! I did eat the beef stoganoff made by a real Russian cook. Delicious. Wonder if the chicken has the same taste? It worth a try! As you said, worth a try. We just love it. Looks so delicious. My Russian brother-in-law's birthday is coming and I want to surprise him with this! This simple dish is so tasty. Hope he'll love it as much as we do. I love beef strognoff, but never thought of making it with chicken. A fantastic idea, Christine. hi christine , may i know can i skip for the tomato paste and Worcestershire sauce ? sweet paprika or smoked paprika better ? And last , the sour cream add on when cooking or after done just stir in the sauce ? I won't recommend you skip the tomato paste. And the Worcestershire sauce will add a depth of flavour. But if they are not handy to you, it's up to you. Sweet paprika is better as it has a clean sweetness that you'll love. The sour cream is to be added in at the end of cooking. To keep the nutrients, I like to stir it in the sauce after turning off the heat. Can I use red wine instead of white? Will the taste be different? The dish will be tinted in red then if you don't mind. Normally, white wine is used in cooking chicken dishes. Thank you Christine for your prompt reply. I will try to get white wine instead. Have a good day! You're welcome, Elyn. Happy cooking ! Just popped in to say thankyou very much for the recipe above!!! it took me ages to make (cause i potter around the kitchen alot) and made my own pasta, but everything was superb and the sauce was fantastic!!! So glad you made this dish and liked this recipe. Good on you with making your own fresh pasta. Absolutely delicious!